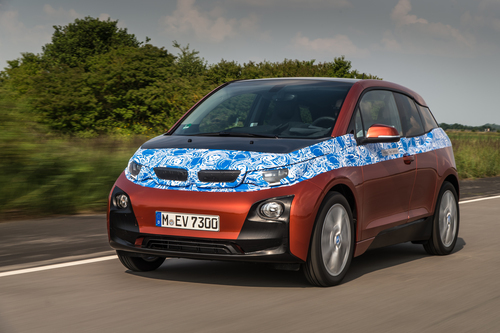 Finally released details of the BMW i3 show show it's a zippy little electric car, with advanced driver assist features. The BMW i3 is that companies first official foray into electric cars. The BMW ActiveE and the Mini-E before it were both experiments in electric cars, leased to customers to gain real world data that's supposed to be folded into the i3 and other future electric and plug-in hybrid cars BMW is developing. On Wednesday, BMW unveiled specifications and pictures of the BMW i3 ahead of its debut later this year. The BMW i3 is the company's first car designed from the ground up to be electrically powered. They claim it's the first ever "premium car" to be designed explicitly as an electric, but we think Tesla might want to quibble about that claim. The vehicle architecture is based around a carbon-fiber reinforced plastic passenger cell. The electric motor, power electronics, battery pack and related components were developed by the BMW eDrive team. It also has BMW ConnectedDrive driver assistance and mobility services. The LifeDrive architecture uses a lightweight carbon-fiber reinforced plastic passenger cell to cancel the added weight from carrying the battery pack. The battery pack contributes to lowering the center of gravity, and the engineers were able to ensure the i3 has a perfect 50:50 weight distribution. The stiff suspension and other aspects of the car give it lots of agility, and a very tight turning radius. The rear-mounted electric motor is rated for 125 kW/170 hp and peak torque of 250 Newton metres (184 lb-ft). This gives a respectable acceleration of 0 to 60 km/h (37 mph) in a mere 3.7 seconds and 0 to 100 km/h (62 mph) in 7.2 seconds. The regenerative braking in the i3 carries over the "single pedal driving" that made the Mini-E so much fun to drive. When the driver lifts their foot off the pedal, the regenerative braking system immediately kicks in recovering energy into the battery pack. The effect is somewhat like the engine braking in a stick shift car. The BMW ConnectedDrive software offers multi-faceted assistance to the driver. The most intriguing of which is that it can help a car driver plan a multi-modal trip using not just their car, but mass transit systems and walking as a pedestrian. For example the system could guide an i3 driver to a parking lot on the edge of town, then to find the nearby mass transit hub, which bus or train to take to their destination, and walking directions in between each stage. A driving assistance feature includes collision warnings that responds to moving and stationary vehicles as well as pedestrians. A parking assistant feature does all braking and acceleration required for fully automatic parking. A traffic jam assistant helps the driver manage speed and braking in tight traffic.